"Isabelle Thornton" Le Chateau des Fleurs: Marie Antoinette Bedroom makeover. My Grand mother was called Antoinette...one of my favorite name. My favorite movie of all time is Marie Antoinette by Sofia Coppola HERE. 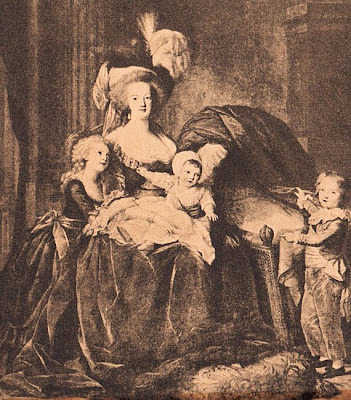 To learn more about Marie Antoinette and her life HERE. Do you remember my bedroom ? The post about it is HERE. See how much and where things come from. Here is my Spring/Summer look....Marie Antoinette Style. Zebra pillows, one of my favorites. The bedding was bought years ago at JC Penney HERE. They have great, romantique beddings, one is on front page of their bedding department now and would work great. Little tart, They are a French Classic. Got it from Kneaders HERE. Marie Antoinette at Versailles HERE. Alice in Wonderland Party. HERE. I do love a pretty up do! You look gorgeous! My favorite part is your little tea party all by yourself! I need to do that sometime & today is sounding good! But I don't have a tea set as pretty as that, that's for sure! Your bedroom is gorgeous & looks like such a wonderful place to relax! Thanks for the peek! Love your tea party too. What a comfort and how lovely your bedroom looks. Quite a haven for you and your family. Happy Monday! Oooo........your hair ........is great !! !..............is fab !!! Your bedroom is lovely! I like all the details and love your up do too! Beautiful bedroom accessories and hair do. You must have sweet dreams in that gorgeous room. I can't believe that some of the bedding came from JCP. Your bedroom is absolutely beautiful!!! I love your hair too!! Looks wonderful! Love it! Especially the pots, pictures, and pillows! Can't wait to see the tutorial for the pot. oh your room looks so comfy, cozy, how can you ever leave it? Beautiful! And I love your hair as well. gorgeous room! i dream of visiting versailles and seeing (among other wonders) marie ant. 's little village (i can't remember the real name of it) where she would play peasant and herd sheep. great job on the room. i think it has her playful spirit. You look divine with your up do! Looking forward to the "how to" on your little pot. I love it! You did such an amazing job! And that little tea set is too much! Beautiful bedroom...love the canopy bed. The flower pot is adorable. Becca, the Marie's little private side was le petit Trianonwas her little mansion. I will talk about it tomorrow. She had a Farm, a "moulin" by the water also. mmmm.... say magnifique!!!! Adore the bedroom decor! with the warmer weather I love sitting outside and enjoying a cup of tea on the terrace by myself just as the morning is opening - listenong to the birds. I look fowrad to learning how you did that pot. You are so creative and inspiring! Oh ma belle, on dirait Marie Antoinette chez toi!! JOLIE CHAMBRE, JOLIE MADAME, JOLIE OBJETS D'ART.....Qu'est-ce qu'on peut demander de mieux? Gorgeous Frenchy! It is always so fun and charming to visit here..beautiful room..and bedding..woah!! Lovely!! Loveeee your blog! Anything french catches my eye, because I am in love with Paris and the beautiful country of France!!! I've been there three times now and never can get enough, but your blog post today sure gave me a wonderful flashback! looks really great!!! I love the floors. And the bedding. Yes we served together at temple square those many years ago,Sister Signs (Melinda Signs Williamson on Facebook). Sorry I have not maintained my blog as well as I had hoped life gets soo crazy sometimes. Bolgs are the best way to keep a journal for the family. Yes we have adopted 2xs and are doing it again, to make it 5 kids (oh my goodness). you have a great talent for style. It's fun to follow your blog. What a beautiful bedroom. I loved it. That and the orchids. So pretty. Your spring bedroom look is so nice! It looks so cozy and romantic. I love it. And I seriously want a tart now. Delicious. My grandmother's name was Minnie. I love it. OMG, I'm in love with your bedroom! It's super ladylike! I love every single detail! Congrats! Oh yes I do love your spring 'Marie Antoinette' look! Love the zebra pillow too...I have a collection of animal print pillows-giraffe, zebra,leopard, and bear. They are so fun, aren't they? And you are adorable in your Antoinette curls!!! So cute. I love your tea setting...your room has a soft, peaceful glow. And those wood floors are what we want to put in Sea Cottage...someday. i am in love with your bedroom! especially the zebra pillows. it's kindof my thing now. lovely. I just found your beautiful blog and just became your new follower.. I would love to have you as my follower too on my blog.. thanks! Thank you for all the love. You are the best! One would feel like a queen in that bedroom. I love love love the black and white tea set. Wish it were mine. Your bedroom looks nice. Love the tea set. I hope you'll drop by AtticMag and register for our Giveaway! The bedroom,your pretty picture, the chic colours, the unepected colurs, the teaset, even curlers..,oh my! ; what a delightfully refreshing surprise! Ah, a woman after my own heart, you francophile!!! The room is gorgeous, especially those pillows and I LOVE the tea in there! Gorgeous! Your updo is so applicable! So beautiful and chic! I love everything French! I especially love the hardwood floors in the room. Do you know what brand they are? I agree, oh la la! Your bedroom looks like it is out of a magazine, sweetie! You are a talented lady! The tea set is precious. Beth, they are from RC willey. Can't remember the brand but they look Antique and dark brown. that's a fab makeover and you're pretty hairdo... i love Marie Antoinette's Style too! see you around! Hello hello My Dear, What a lovely BR you have. Your beautiful floors caught my eye. You did such a pretty room. It looks so pretty and feminine. I love it. How gorgeous! I just want to take a long, deep breath and sigh! Looks so pretty and relaxing! 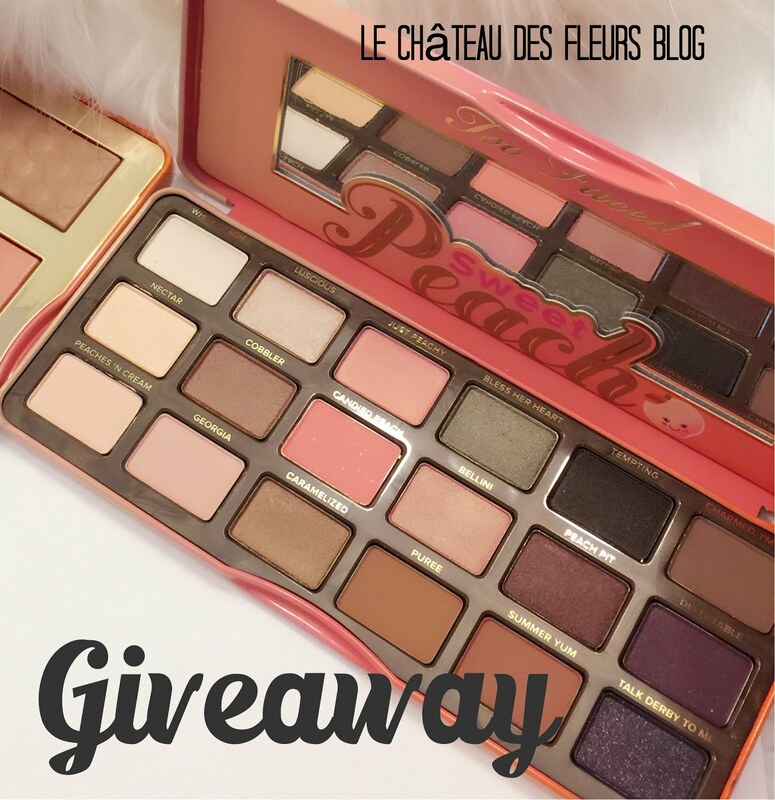 Be sure to join my current giveaway! Oh what a lovely spot to be Marie Antoinette -- a girl could just lose her head over that pretty room! Love your pretty little tea party for one. I love your nice large bedroom and that beautiful bed. Tres chic!! Thanks for planting your creative seed at Plant a Punkin Seed Party. You have such a lovely blog. This is my first time here. I would not have thought of Marie Antoinette having zebra striped cushions though. I guess we have to use our imaginations for that one. I love the plank floors in your bedroom. I'm so happy to see you for Sunday Favorites today and what a fabulous post to share with all of us! Ohhh my...your master bedroom is gorgeous...so spacious and I love the colors that you chose to do it in! I just had to go back and take a peek at your master in the link that you gave. Ohhh...I do adore that beautiful blue ceiling...it's so magnificent!!! Love, love, LOVE your beautiful bed! You know, I often shop JC Penneys...I find the quality is good and very reasonably priced! 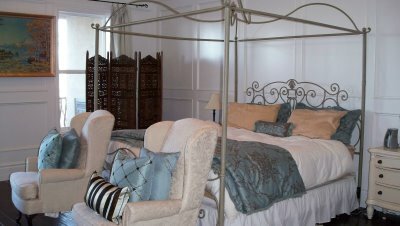 I have been "eyeing" a beautiful french styled bed from there for sometime now..and it's on sale! Ohhh...I am sooo tempted! Hehe! Love all of your bedding...the blues and browns...and the new bedding for your spring look is simply gorgeous...very romantic and yes...so very Marie Antoinette!!! I think that Marie would be very comfortable and at home in your lovely bedroom, my friend! I have never taken tea in my bedroom but really must do so...your tea is such an inspiration! Love your black and white transferware tea set!!! My friend, you are such a beautiful woman...love your "up-do" hairstyle! I have really long hair...I should give this style a try! Thank you so much for participating in Sunday Favorites, dear lady...your gorgeous frenchy bedroom has been such a treat!!! Sweet! I hope you're having a lovely Sunday! Love the bed! Oh la la.. comfy and the tea party just scrumpcious! What a pretty room. Nice job pulling it all together! Stopping by from BNOTP. I love your make over in your bedroom. I am just starting to read books on Maria Antoniette. Another great post, Frenchie!! I adore your bedroom and that blue ceiling!! The tea party looks like such fun and what a pretty tart!! I LOVE this room! I just want to grab a book, close the door and relax. Great job! Wow that looks great! For a second I thought that it was the same room, I really had to look closely to see it wasn't. Great job! Love the room, love the hair, love the flower pot... I love it all!!! It looks like a photo shoot out of Romantic Homes magazine! Thanks so much for linking this one up to "Brag Monday". It's always such a treat for me to see what you come up with! Your room is divine. The tea so sweet, and the coiffer...2 die 4! I am giving away a free teapot in April! What a gorgeous, romantic bedroom! Love it all. Gret up-do too! Wish my hair looked like that! The room (and you) are beautiful! (I see my comment from April 7th, so I shall not repeat myself my dear;sufficed to say, this post is just as delightfully lovely as ever! ~Everything formm blue and white kitties at tea to many surprises await when you scroll doen the page!~ I would so enjoy to hear from you! I love this post a much as the first time I saw it my dear!.., (As I was scrolling down the page I saw my previous comment, so I shall not repeat myself); yet I adore this darling Marie Antoinette bedroom, and teatable vignette!! Beautiful room and you are so pretty! Very pretty color scheme in the room and many lovely touches. -- Jane F.
Very pretty room, I love the colors. Such a lovely room! I just love all of the beautiful rooms in your home - Thanks for linking up to Be Inspired today! Your bedroom is wonderful! I love your Tea! I adore tarts! I just love your teapot and tea cup! I so wanting to find the black toile teapot and cups. I longing for them a long time! How wonderful your hair do is! Love it! Such a relaxing bedroom Tea! I love the blue ceiling! Sooo pretty. That's gorgeous! I love that it's traditional in style but still clean and simple. So beautiful. I love your romantic french style. And you are making me miss Kneaders! Absolutely beautiful!! If my room looked like that, I'd never leave it. Lovin' the up-do too! Makes me want to grow my hair out. How fun to change your bedroom for the season! I love the new look! :) And your hair is BEAUTIFUL! Love your blog, your bedroom, and your tea setting too. Please come on over...it is TeaScape time at BellaCasa. You've surrounded yourself with so many pretty things! You are definitely living the good life there! Hi Frenchy, I really enjoy my visits to your blog, you have such great imagination. Like letting the binkys go. I posted your link in my blog, it's nice to share great blogs with others. Happy Pink Saturday! Oh my your bedroom is wonderful! I'm loving this. Thanks for joining Get Your Craft on Thursday. Please join me next week for another great party. I wrote down the name of your blog to come back and visit your "all things french" a second time. The room is delightful and filled with wonderful details. We have a friday fun finds party that's still going- we'd love it if you'd link up! Truly lovely! Your hair is gorgeous, as is your bedroom and I love your teaset and the tart! That is an amazing impression of a modern Marie Antoinette bedroom! Very inspired! What a gorgeous room, home, family! I love your post about binkies in heaven, and I'm so glad to "meet" you and discover your blog! I do believe you have forgotten her beheading...is that next on your agenda? She was a Woman, a wife, a mother. There is more to her than her death. Most people are famous for the negative. It is very sad. This is why i love Sofia Coppola's movie. She portraits her as an human. Yes, in France there is bad feelings about the king and nobles at the time. it will not happen again and people had their revolution. But at the end of the day. Rich or not. People are just people. Well said! I am going to have to re- watch it. I am the Italian version of Antoinette my name is Antonietta.